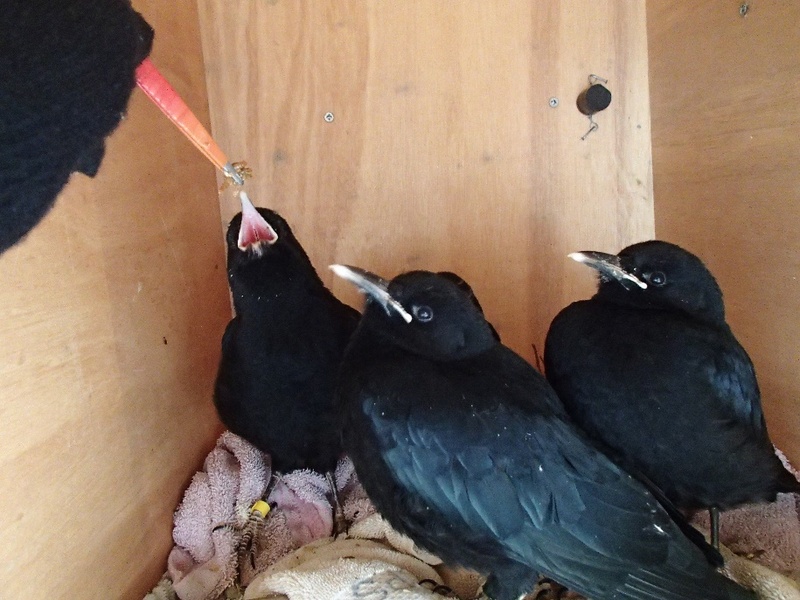 This month’s report is being split up over the week so we can introduce properly our four new, Jersey-bred, choughs. 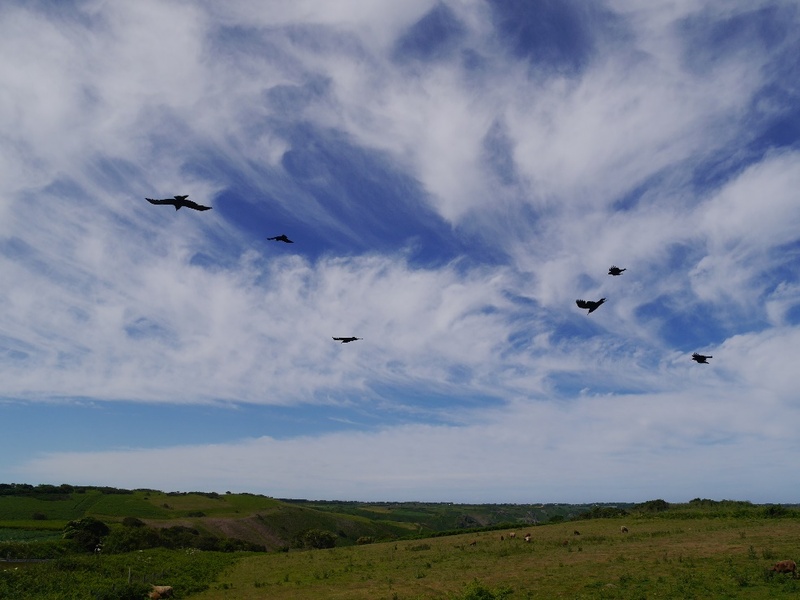 June was an amazing month of firsts for the project and the choughs: it marked a new chapter in the lives of the free-living choughs as well as for the chicks. 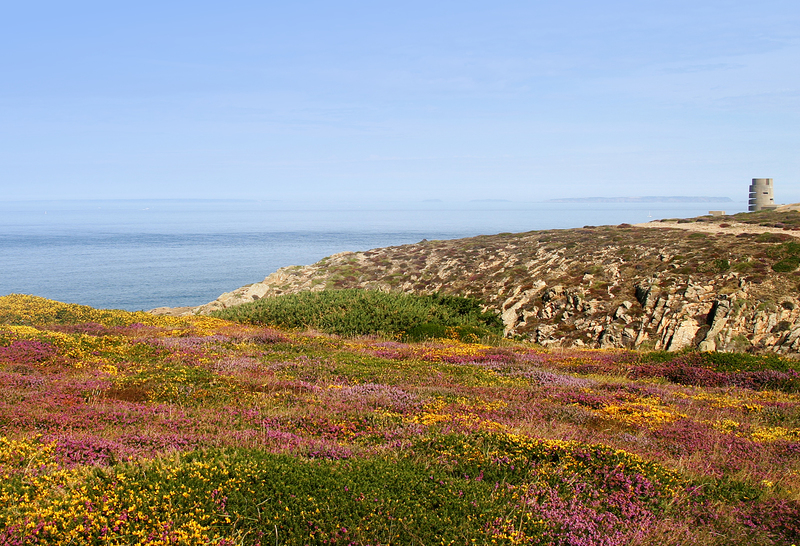 In turn, the project moved forward into exciting new territory….and I don’t just mean Alderney! For the first two weeks in June, Durrell participated in Living Islands: Live. This is an exciting cross curricular education project run by Alderney Wildlife Trust in association with South East Grid for Learning Associates. It offers schools the opportunity to bring the fascinating life of the puffin and other seabirds live into their classrooms. One of the many ways in which this is done is through interacting with the live webcams set up on the island of Burhou. Living Islands: Live links directly to the Key stage 1 & 2 curriculum, and is an effective way of teaching science and literacy skills, and promoting pupil creativity and confidence. 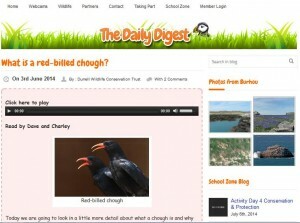 Durrell was invited to take over for two weeks to teach children about the chough reintroduction project and how it relates to the broader role of Birds On The Edge. Daily blogs, updates from the field and weekly homework questions kept the children engaged. At the end of each week live webchats were held for participating schools to fire off gruelling questions to team members. Throughout, and continuing to this day, participants can also leave questions and comments on the message forum. Feedback from the schools was encouraging and supportive. The children loved to see the chough chicks being hand-reared and are super keen on borrowing Arthur the chough outfit. Although, at the end of the day, I have a sneaky suspicion that the puffin is still their favourite. We have a confession though. We may have told a few white lies to young and gullible children. Well, not lies, more like omissions. During those two weeks something very exciting was happening on the project. Due to the sensitive nature surrounding it and to ensure that it worked to the best of our abilities, only project partners were informed of our plan. Known as “Operation: Moving day” our plan was simple yet fraught with a hundred and one ways to go wrong. The soft-release methodology has always been based around the need to release juveniles not adults. Young are quick to learn and eager to respond to the keeper. For one reason or another we have not been able to put this into practice. The birds available to us have ranged from 1 to 4 years of age at time of release. 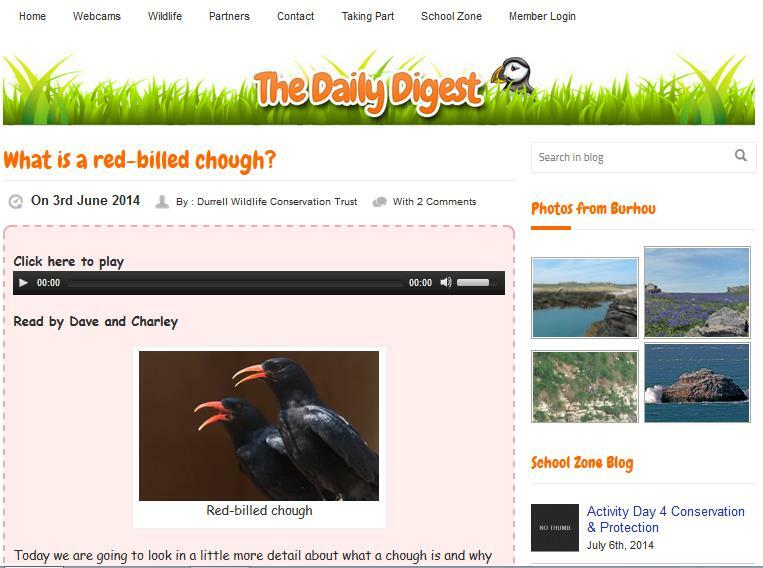 With a chough’s sexually maturity hitting around 3 to 4 years of age it means we have in effect been working with teenagers. Hormones sometimes raging, reluctance to do what they are asked, staying out all hours, but still wanting their ‘parents’ to provide food and lodgings. Sound at all familiar? The six flying around Sorel prove it can work without very young birds. However, it hasn’t been easy and there have been expected losses. Now with the four hand-reared chicks we finally have the opportunity to do what we set out to do. Our plan was to follow the “hacking” approach used successfully with birds of prey, but with a bit of tweaking to suit our circumstances. 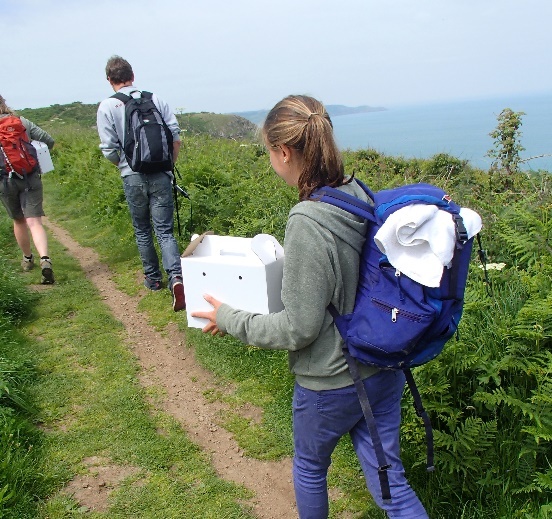 The chicks needed to be taken up to the release site before fledging and placed in a nest-box within the release cage. The advantage to getting the birds up to Sorel and released as young as possible is that the birds learn all of the appropriate social and survival skills at the times they normally would during their early development in the wild. The four birds might have some behavioural problems associated with the hand-rearing. However, being raised as a group instead of individuals, will make some of these obsolete and others should correct themselves during the post-fledging socialisation with the released birds. There was a considerable amount of preparation needed before the chicks could be moved. 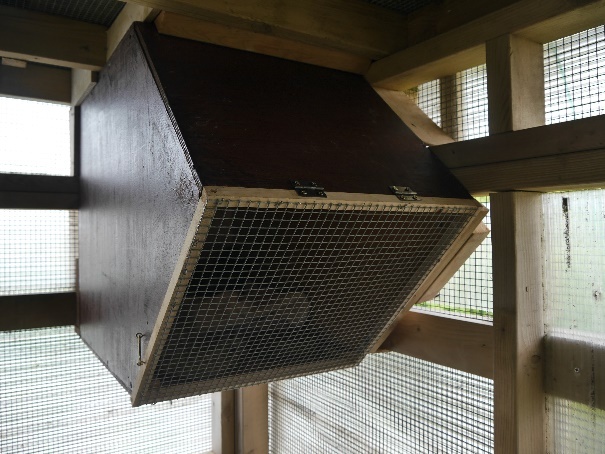 At Durrell the chicks needed to be acclimatised to outside weather conditions. Room temperature was gradually reduced and skylights left open during the day. We couldn’t avoid the fact the chicks were housed in a brick building and that conditions would be very different to those of a netted aviary on the cliffs. 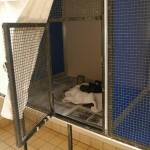 So, adjustments were made to the aviary at Sorel to make it a bit more windproof and insulated around the nest-box. The chicks would be shut in to one of the roofed shed sections to aid this. 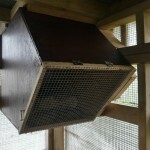 The nest-box was placed high in a corner with ledges and perches surrounding it to allow the birds to easily leave and return to the box. 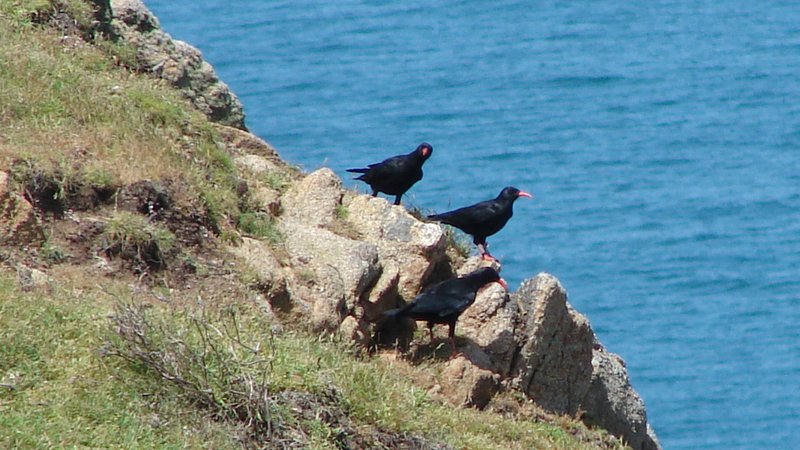 Choughs tend to explore their rocky surroundings before taking their first true flight. A chick might leave the nest and start ‘bouldering’ at say age 37 days, but not actually take flight until day 42. We added a mesh door to the next box as a security measure. Until the chicks started to explore we wanted to be able to shut them in overnight preventing any unnecessary tumbles in our absence. More importantly it was to stop any rodents getting to them. There had been an increase in rodent activity in May. Holes were appearing in the netting and with hatches left open for the adults there was an open invite to go inside the aviary. Adam and Pierre helped excavate ground and lay down half-inch weld-mesh securing it to existing mesh on the sides on the aviary shed. Any gaps in the ceiling or wall mesh were secured until the entire section was rodent-proof. Soil and turf had to be replaced so the chicks had something to probe on the ground without damaging their bills on the mesh. 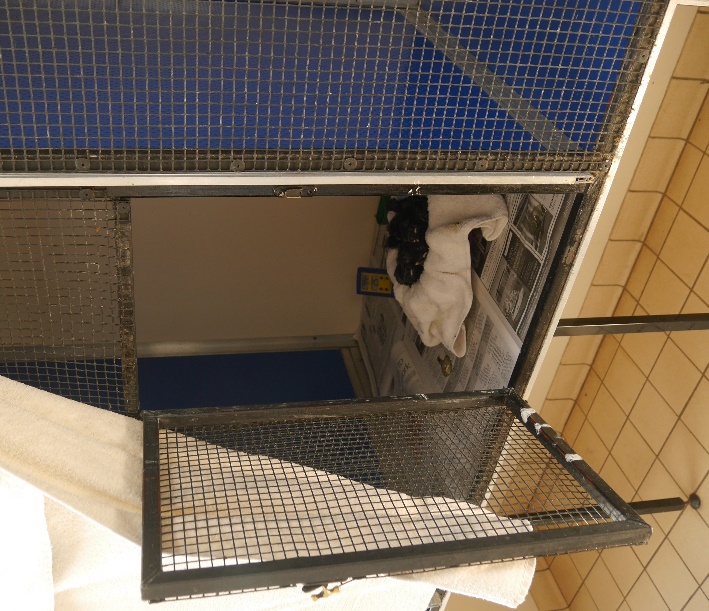 We also had to consider the adults flying free as they would need to be locked out of one section to start with, and eventually from the entire aviary. This would mean a reduction in potential roost/shelter sites so we added two new roost-boxes to the polytunnel. We were not confident they would use them simply because they roost together and the boxes would only accommodate three or four at a time. They always have the quarry as their friendly alternative. 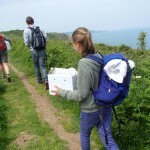 On 2nd June, the chicks were moved from the rearing rooms at the Durrell Bird Department to the release aviary at Sorel. We tried to do this as covertly as possible to avoid attracting attention. It was very difficult to do this with four chicks loudly chirping away continuously from the car park to the aviary. Once inside and settled into their nest box they were deafening with their begging. It can only be a good thing as it meant they weren’t fazed by the move. Hand-feeding continued in exactly the same way as before with feeds starting at 7am and finishing around 7pm. The first feed up at Sorel was entertaining for all as the chicks begging attracted the attention of the adults from the cliff path. The noise inside and out of the aviary was ear-splitting as the chicks begged loudly and the adults wanted to know who the new arrivals were. The adults walked along the roof to get a good look into the ‘fledging cage’, but with the chicks in the nest-box they were not able to see each other. By the second feed the noise from the adults had died down and only a few of the single females wanted to peer in. From then on the adults would use the chicks begging call as a cue to fly to the aviary in full knowledge a keeper would be there with food. The adults continued to roost in the aviary whilst the chicks were locked in the one section. In the next report we will introduce you properly to the newcomers.